The story about Bob Dylan and the Band is a fascinating one with many compelling chapters. The folk king Dylan going electric. A longtime backing band coming into their own known simply as The Band. Dylan’s motorcycle accident and the Woodstock years. Their re-teaming on the Before The Flood tour and the Band’s Last Waltz. The documentary Bob Dylan And The Band: Down In The Flood (out now on MVD) covers this rich musical ground and does so in a very informative, entertaining way, which is a fine accomplishment since it is an unauthorized film lacking participation by Dylan or the Band, save for Garth Hudson (whose grizzled answers could benefit at times from subtitles). These absences make the film (which, judging from the narrator, is of British origins) not a totally authoritative look at Dylan and the Band, but the filmmakers do an excellent job of working around their obstacles and coming up with a strong set of close associates and music experts to talk intelligently about the story of Dylan and the Band. The close associates include session drummer Mickey Jones (who subbed for Levon Helm on Dylan’s 1966 U.K. tour), Nashville session ace Charlie McCoy (who appeared on John Wesley Harding, Blonde on Blonde and Nashville Skyline), producer John Simon (who helmed the first two Band albums) and the one and only Ronnie Hawkins (who assembled the Hawks as his backing band), who all share first accounts of their time with Dylan and/or the Band. 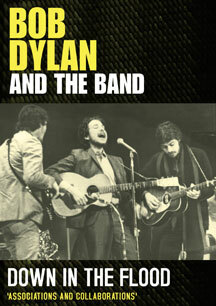 Esteemed critics like Robert Christgau, Anthony DeCurtis and Barney Hoskyns (who penned the Band biography Across The Great Divide) as well as musician/country-rock historian Sid Griffin and British music writer Derek Barker also contribute commentary and tales about Dylan and The Band. So the stories that viewers get aren’t coming from Rick Danko’s second cousin or the guy who sold Dylan his sunglasses. These are people who were there or who are well versed on Dylan and the Band. Among the stories told is Mickey Jones talking about those infamous England shows and how Dylan paid for his salary when the motorcycle accident causes the cancellation of the tour Jones was supposed to do with Dylan. Griffin describes how the Band plays with a different level of musicianship and emotion than when they were the Hawks backing Dylan. There is also an insightful considerations of the religious imagery in John Wesley Harding as foreshadowing Dylan’s later “Christian” period. Sure, the film relies a bit too much on second-hand anecdotes and some vintage interview footage of Dylan and the other Band members would have been nice. However, if you keep the filmmakers’ handicaps in mind, there is much to enjoy in the documentary, making it something of a must-see particularly for fans of Dylan, the Band, and Americana music. This entry was posted in Film, Movie, TV & DVD and tagged Anthony DeCurtis, Barney Hoskyns, Bob Dylan, Charlies McCoy, John Simon, Last Waltz, Mickey Jones, Robert Christgau, Ronnie Hawkins, Sid Giffin, The Band. Bookmark the permalink.